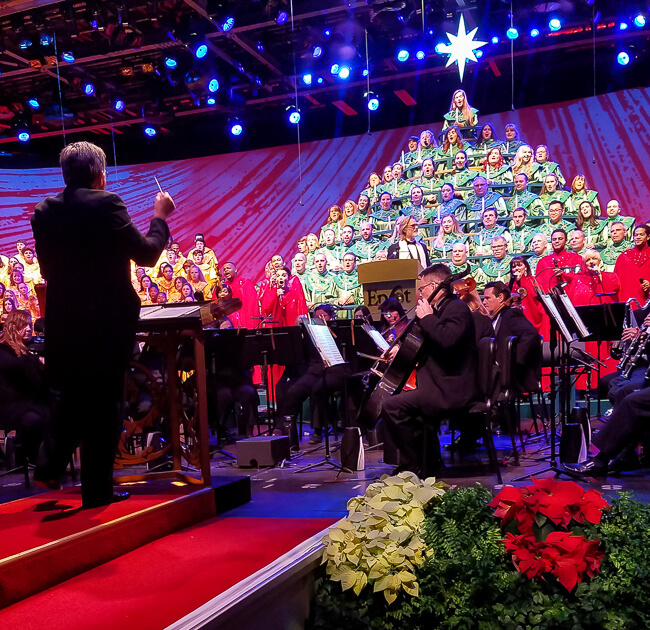 Disney’s Candlelight Processional is an epic holiday event featuring a mass choir, symphony orchestra, and impressive list of celebrity narrators. 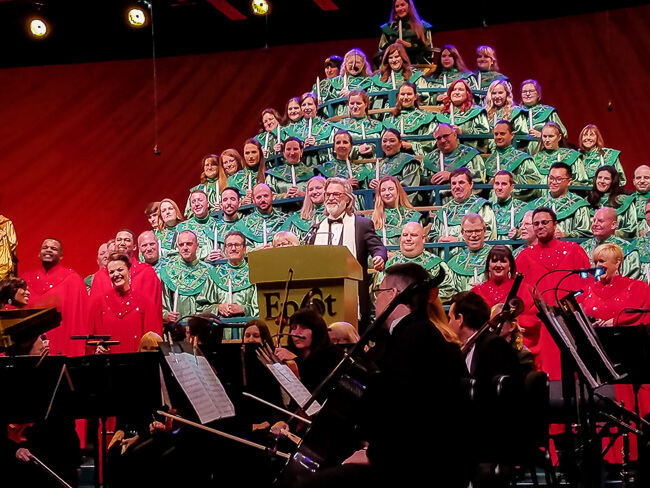 Enjoy all your favorite holiday tunes and listen to your favorite celebrities as they tell the tale of the very first Christmas. 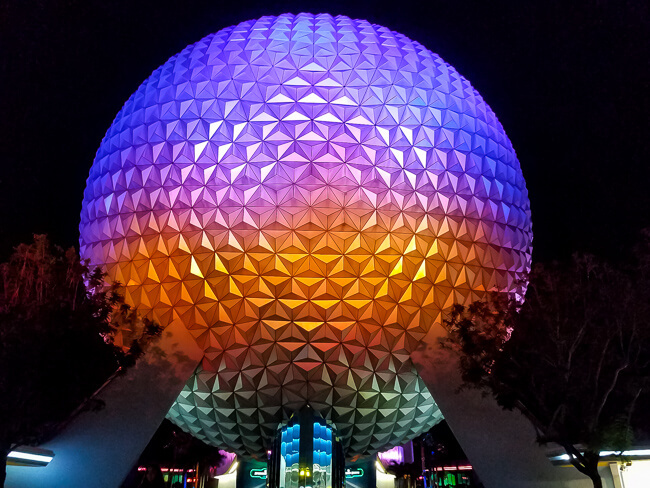 Its an amazing experience happening right now at Epcot and a perfect opportunity to create new and exciting holiday memories. 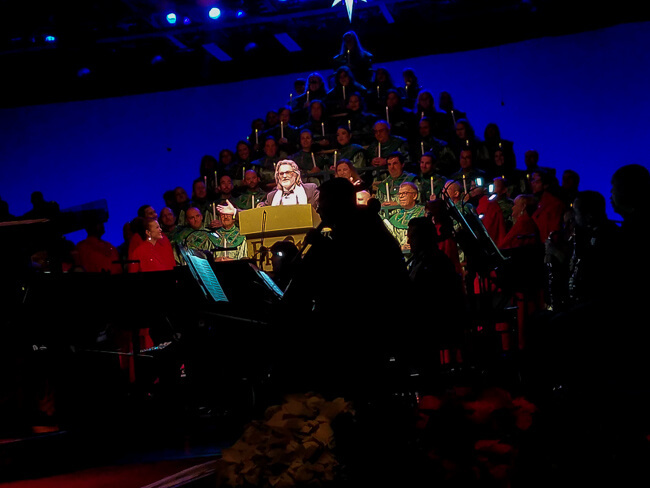 The Candlelight Processional is a Disney tradition that’s been going on for a long, long time. Much longer than I’ve been alive. Celebrities and talented individuals have been lending a hand to make this a special event since the 1950’s. As a result, thousands of people come from all over the world, year after year, to join in the tradition. As this was our second consecutive year in attendance, we are on the path to making a holiday tradition of our own. After enjoying an evening with Neil Patrick Harris last year and Kurt Russell this year how could we not look forward to 2018? Getting to see Kurt Russell was incredible. I grew up watching his movies and have been a fan for as long as I could walk, so for me, the experience was priceless. I was a bit disappointed when I realized I left my SD card at home but once the show started I was just glad to be there. By the time Kurt Russell came out I was back to feeling festive and enjoying the experience of a lifetime. Good news is there’s still time for you to enjoy the festivities. The event is happening now until December 30th so there’s no reason to miss out on all the fun. If you double check your camera before leaving the house you won’t miss out on great pictures either. 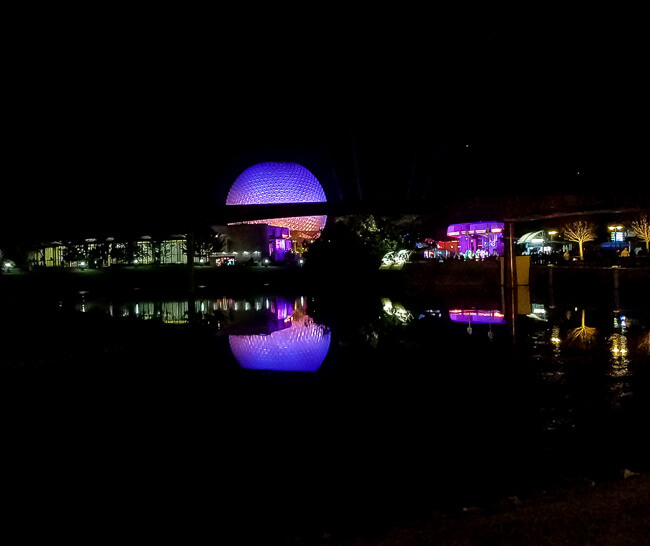 All you need to attend the Candlelight Processional is admission to Epcot. Seating is first-come-first-serve and no special tickets are required however guests can enjoy guaranteed seating with the purchase of a Candlelight Dining Package. See Disney’s website for details. Seating is not guaranteed for general admission so be sure to get there with plenty of time to spare because even stand-by seating lines get long. It’s one of the highlights of the holidays for many. Keep in mind the event is outdoors. Be sure to dress for the weather.